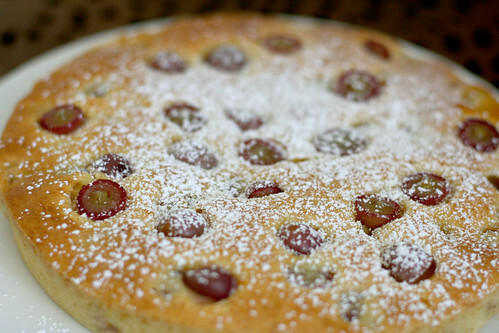 I experienced my very first grape cake at the little French bakery stand at the Dubai Farmers Market last month. It looked so interesting and novel that I had to buy one. It enjoyed it so much that I made it my mission to get hands on the recipe. It took a bit of research, but I finally found it. The Winemaker's Grape Cake. I never would have thought to use grapes in baking. I love them for snacking, in salads, and even pickled. But they work unexpectedly and perfectly in this cake. That light texture that I adore comes from using half butter, half olive oil, and the lightness is further highlighted by the use of both lemon and orange zest. I'd recommend this cake for brunch or afternoon tea, although it could also play the role of dessert quite well. I halved the grapes, but if you prefer to leave them whole, that would work as well. 2. Generously butter and flour a 9" springform pan, tapping out any excess flour. Alternatively, line a buttered and floured 9" round cake pan with parchment paper, then butter and flour the parchment. Set aside. 3. In the bowl of an electric mixer fitted with a whisk, beat the eggs and sugar until thick and lemon-colored, about 3 minutes. Add the butter, oil, milk, and vanilla extract, and mix until blended. 4. Sift the flour, baking powder, and salt into a large bowl. Add the lemon zest and orange zest, and toss to coat the zest with flour. Spoon the mixture into the bowl of batter and stir with a wooden spoon until thoroughly blended. Scrape down the sides of the bowl and mix once more. Set aside for 10 minutes to allow the flour to absorb the liquids. 5. Stir about 3/4 of the grapes into the batter. Spoon the batter into the prepared cake pan and smooth out the top with a spatula. 6. Place the pan in the center of the oven. 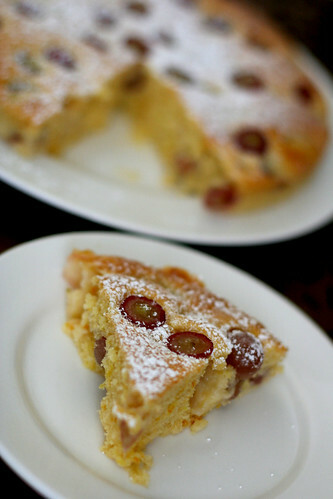 Bake for 15 minutes, then sprinkle the top of the cake with remaining grapes. Bake until the top is a deep golden brown and the cake feels quite firm when pressed with a fingertip, about 40 minutes more, for a total baking time of 55 minutes. Remove to rack to cool. After 10 minutes, run a knife along the sides of the pan. 7. Release and remove the side of the springform pan, leaving the cake on the pan base (or if using a regular cake pan, invert the cake onto a platter). Sprinkle with confectioners’ sugar just before serving. Serve at room temperature, cut into thin wedges. I've never baked with grapes, but I'm intrigued! Such a good idea! I love grapes...and baking with raisins...but for some reason have never thought of baking with grapes! What's the cake texture like? Is it sort of pan-cakey? I'm TOTALLY baking this cake. It's perfect for when my Knitting Ladies come over! thanks! i want to make this NOW!!! sooooo simply delish--like comfort food!!! Yummmm! I'l love to have this right NOW, too!